But i have one main issue. We need to get their order to looks continuously so for instance, i go over the reds, than right to the orange, than to the yellow,green, etc. What algorithm ,or pseudo code should i use to get them in that order ?? Start from 255 0 0, then count up g to 255 255 0, then count down red to 0 255 0, then count up blue to 0 255 255, then count down green to 0 0 225, then count up red to 255 0 255, then count down blue to 255 0 0. 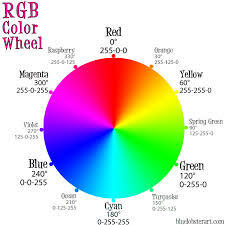 Start from HSB or HSL values then convert them to RGB. What you need is linear interpolation of colours to give that smooth transition from one color to another. I'll give a simple workout for you to understand the math involved. If you interpolate from Red -> Yellow -> Green -> Cyan -> Blue -> Magenta you'd get a line with one extreme being Red and the other being Magenta. Now to create the HSV wheel you've posted in your question, one needs to do both radial and axial interpolaton. Hue (or the actual colour) is radially interpolated i.e. based on the angle. The smoothness (stops) here would be based on angle instead of distance. Saturation (vividness) is interpolated radially i.e. based on the point's distance from the centre. The centre is pure white while the point at the circumference is pure colour. So the line from centre to circumference at angle 0° would start with white (1, 1, 1) at centre and end with pure red (1, 0, 0) at circumference. Do the same for the other angles too (until you circle back to 360/0°) and you'd get the wheel you've posted; it's actually a disc from a greater (HSV) cylinder whose vertical axis would interpolate Lightness (picture in Wikipedia's excellent article linked above). See code below for a live rendering of a HSV wheel. return "rgb(" + Math.floor(255 * rgb) + ","
+ Math.floor(255 * rgb) + ","
Not the answer you're looking for? Browse other questions tagged c colors rgb or ask your own question. How can I plot a gradient line in HTML canvas?